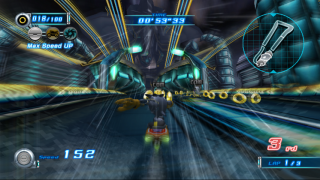 Nightside Rush is the second level in the Babylon story of Sonic Riders: Zero Gravity. Set on the rain-slick service roads of the futuristic city of Monopole, this racecourse is full of vertical twists and turns, sending the Extreme Gear races barreling along the walls and undersides of high-altitude monorail tracks. Watch out for wide turns with no barriers; use of gravity drive is wise if you want to avoid a 300-floor fall. The strange stone with the power of gravity was the engine unit of Babylon Garden! Get the Ark of the Cosmos back from the security robots! Some time after looting the Ark of the Cosmos from Gigan Device, Jet is impatintly listening to Wave's report aboard the Babylon Rogues' airship. According to the swallow, the Arks can control gravity, and the five units are transmitting to each other in an effort to gather together. As they talk, Storm busts into Jet's stateroom, bringing with him a hologram of today's news: security footage of a renegade SCR-GP MeteorTech security robot, stealing a second Ark of the Cosmos from the city museum. Jet orders full speed ahead to Megalo Station, and sends Storm to run down the recalcitrant droid. The race itself requires Storm to race seven SCR-GPs, and come first after the third lap.